Another mystery which we would love some assistance in solving! 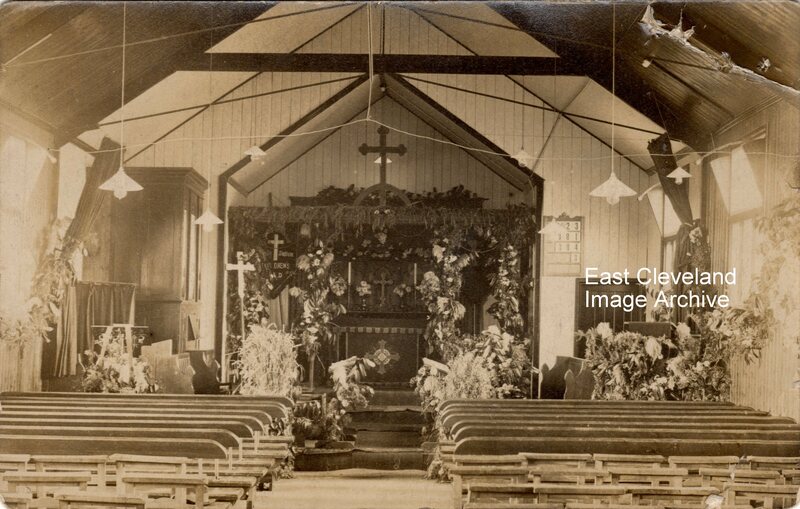 This photograph came to the Archive with a request for any information; is Red Lion Place in Recar? 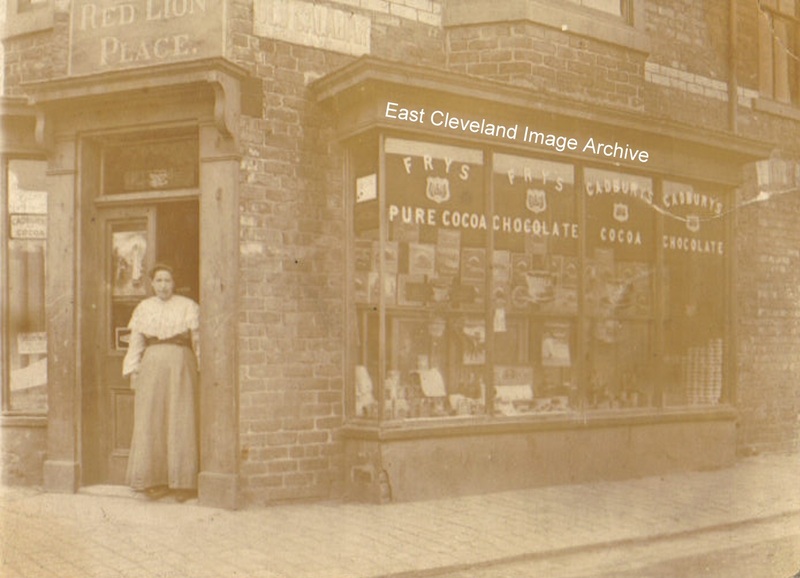 There is a Red Lion Street, which links to Lord Street and was opposite a linking street to the High Street, so named by the Red Lion Hotel which was on the other end corner to the High Street; perhaps this shop was close by? Who is the young lady in the shop doorway and does anybody have an idea as to the date? Image courtesy of Lynsey Peart. The title of this images gives a hint of the link to another image on the Archive of the ‘First House in Dormanstown’, Geoff Kitching brought this image to the Archive with information regarding possible use for the caravan; the reverse bearing the annotation: “Caravan dwelling at 1st house to be built”; whilst Bill Kitching advised: “Workers would come in to work and possibly hire a caravan as accommodation as there would be limited places to stay and it would probably be cheaper”. As the Kitching family had information about a relative; Arch Aubrey who worked as a plasterer for the company erecting the Dorlonco houses, he was visited by his parents and unidentified children, they are believed to be the people in the picture. Alfred Aubrey and his wife Annie, had four daughters (Grace, Ruth, Gwendoline and Winifred) which the Archive can only suppose they may be those in the photograph. The picture must have been taken early in 1918 as there do not appear to be many other houses visible. Image and information courtesy of Geoff Kitching, additional information via Ancestry and Find My Past websites. 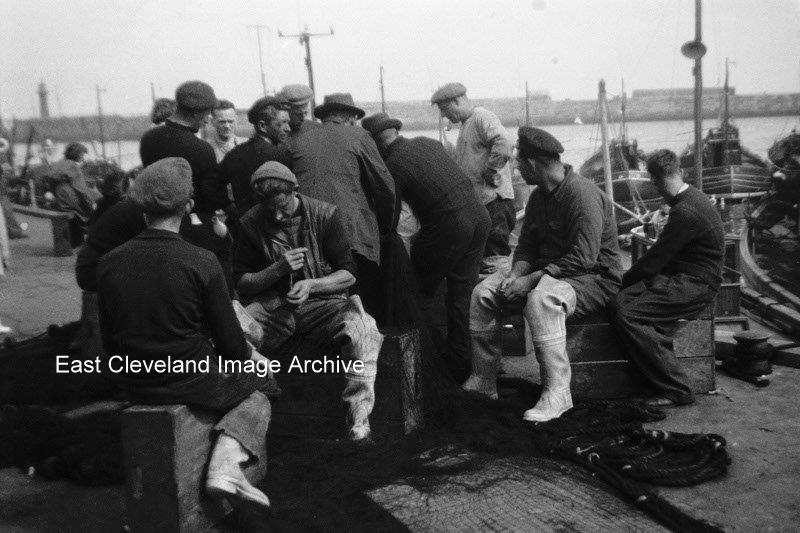 Taken in the 1950’s on a Kodak Brownie box camera this image of the fishermen on the quayside at Whitby brings back memories of a time past which many will remember. Taken by and to the Archive by Brian Hudson; he was born in East Cleveland and now resident in Australia. 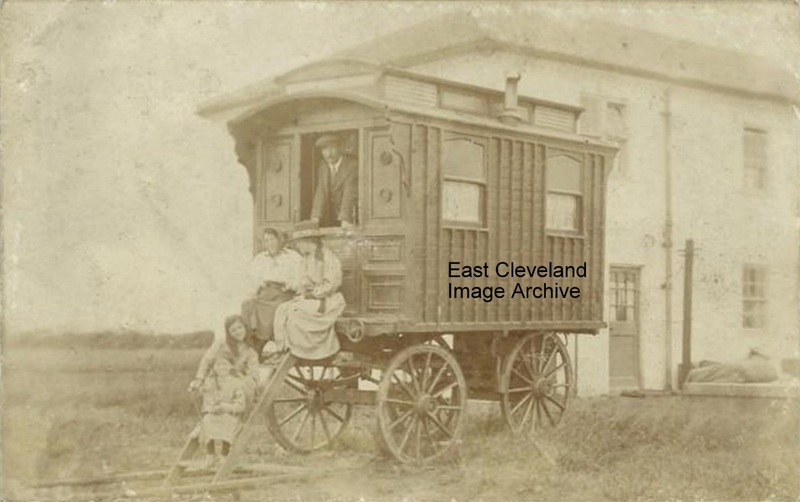 He has lived all over the world, living in Liverpool and Middlesbrough many of his Cleveland images are housed in Teesside Archives collection. Image and notation courtesy of Dr. Brian Hudson (Queensland University of Technology). 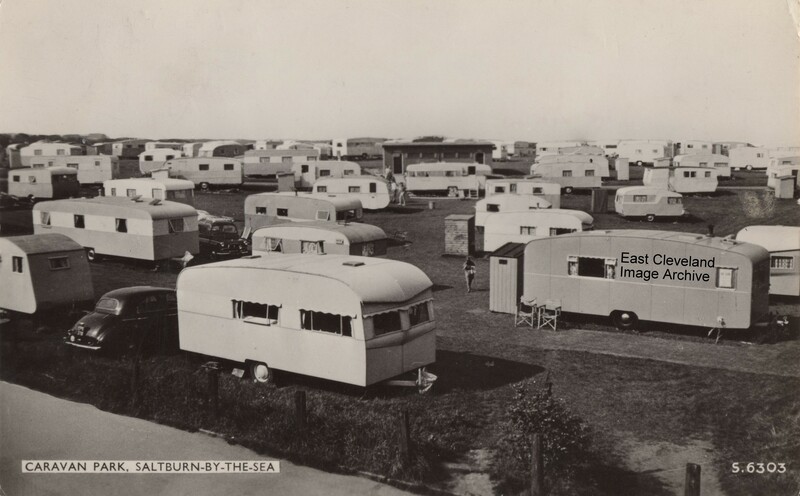 A different view of the caravan park at Saltburn; another Dennis postcard view shows a variety of caravans and towing vehicles with a post mark of September 1966. Obviously some were not touring much judging by their size and little ‘huts’ free-standing beside them. How different to the present day; from the days well before Tingdene with the chalet buildings and large ‘static’ caravans brought to site by trailer, rather than towed in by proud owners. Image courtesy of Julie Tyrka. 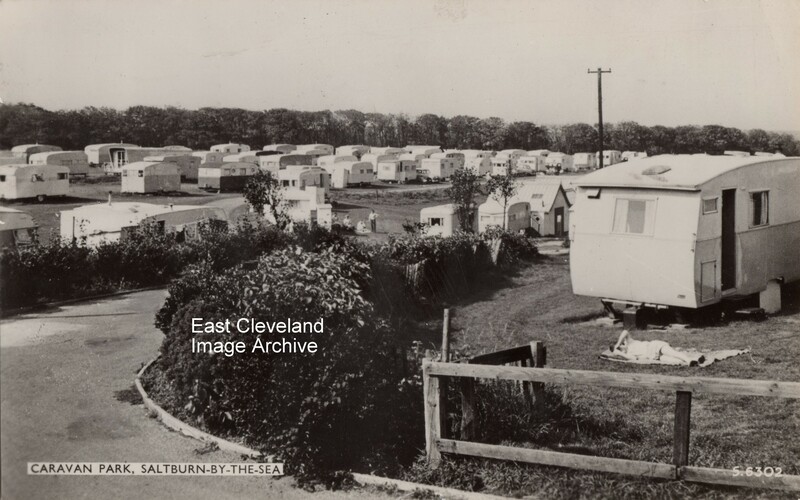 This image of Saltburn Caravan Park in the 1960’s (from a Dennis postcard dated 1966) shows the present day entrance to the Hazelgrove Residential Park with the chalet type buildings. Although there appear to be many almost ‘static’ type of caravans rather than tourers, judging by their size and adjacent structures. Today a very different aspect would be afforded from the same view-point. This image has the comment on the reverse: “First complete steel and Hy Rib house” at Dormanstown; known as ‘Dorlonco’,the design was named after Dorman Long the steel company at Warrenby to house the workers for the steel works, they were designed by Architects: Stanley Davenport Adshead, Ramsey and Albert Abercrombie. 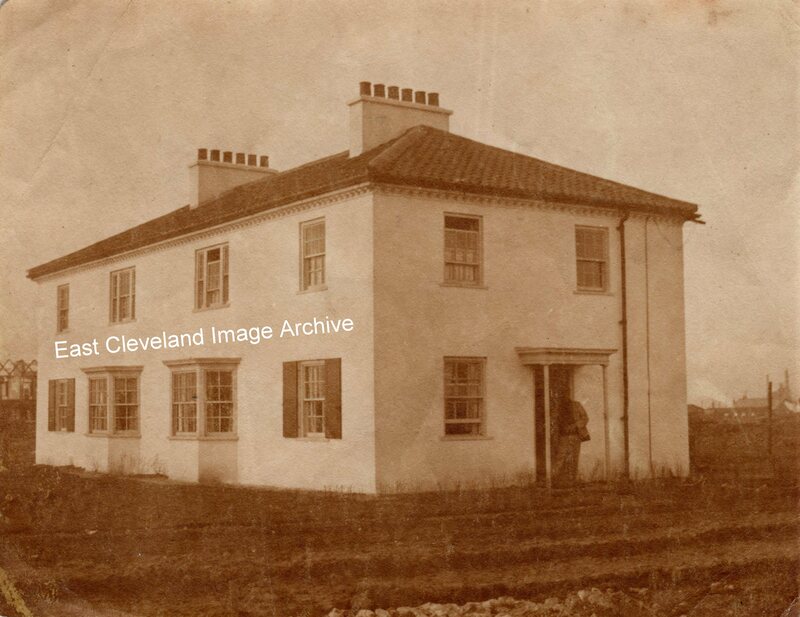 The builders were Jones and Sons of Westminster and Costain Brothers of Liverpool; Arch Aubrey uncle of Geoff Kitching’s father worked on these houses when they were first being built and evidently took this image. Owing to a shortage of bricks the houses were built with steel frames and clad with concrete, but were modestly elegant affairs in the Georgian style. The first 300 houses were built in two styles: kitchen houses for manual workers and parlour houses for clerical staff; Gas was supplied free to every house. When completed in 1920, Dormanstown housed 342 families. The last of the ‘Dorlonco’ houses were demolished in 1979; the streets of Dormanstown still carry names linked to the builders, Architects and even the steel works manager (Ennis Road; which was the original line for the light railway that was built to carry materials on the 850 acre site). Image courtesy of Geoff Kitching. Image and information courtesy of Geoff Kitching (son of Bill Kitching formerly of Carlin How). 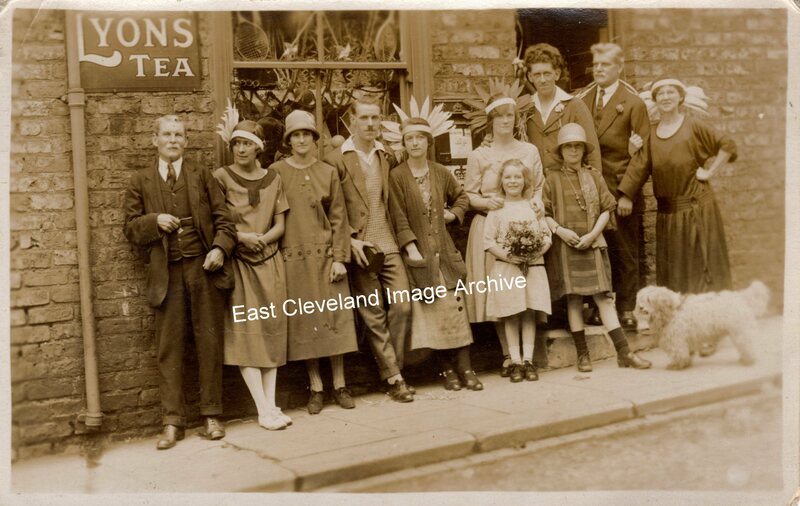 North Skelton Post Office in the 1920s, pictured we have: “The young girl with the flowers is my dad’s sister Sally Kitching and the other young girl is his eldest sister Edie. The post office was run by my dad’s great uncle Bill Young and his wife Bessie who are the two figures on the far right here. The young woman second from the left is dad’s aunt Annie (Smith), next to her is his Aunt Nellie and then Arch Aubrey who was the husband of Annie Smith (they married in 1924). I don’t know what the occasion was. We think the Post Office was at 10 Wharton Street.” The Archive can confirm that William (Billy) Young was Sub-postmaster with his wife Bessie at 10 Wharton Street; they still lived there in 1939. The Archive would again welcome information as regards the possible occasion, especially as all present were obviously celebrating some event. Image courtesy of Julie Tyrka; thanks to Maurice Dower for the update and many thanks to Geoffrey Allen for the excellent update. 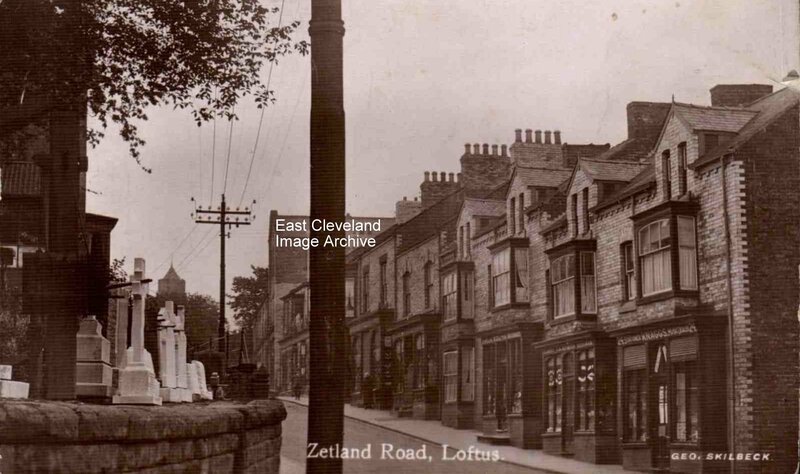 Taken from a George Skilbeck postcard view of Zetland Road, giving an excellent view of both Arrowsmiths memorials on display and the windows of Knaggs shop in the premises in the present day occupied by the Opticians. Can anybody assist with a date for this image? 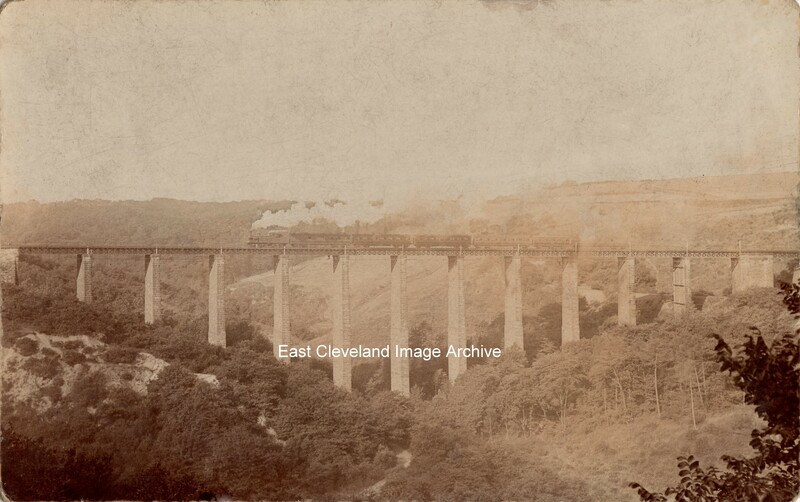 Image courtesy of John G. Hannah.